FRANKLIN, Mass. 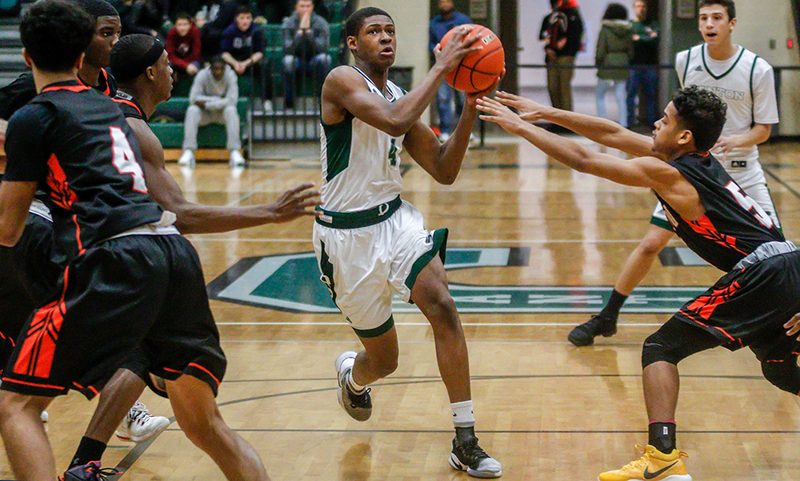 – After seeing a large first half lead disappear, the Franklin boys basketball team was on the verge of letting a second half lead evaporate as well. Holding a five-point lead with 1:30 to, Franklin’s advantage quickly shrunk to just one after a putback from Taunton senior Michel Quinn and a strong take from Lou Vendrell with 39.8 to go. The Panthers, after scoring 20 points in the first quarter, had been limited to just 30 over the next 23 minutes and were in need of a spark. After a timeout, Franklin got the ball into the hands of junior Chris Edgehill (13 points, five assists), and he took advantage of a Taunton miscommunication after a double screen to get enough separation for a three with 20 seconds left, helping secure a 50-45 win over Taunton. Franklin was nearly flawless in the opening quarter, racing out to an 18-2 lead over the first six and a half minutes finishing with a 20-6 advantage after one. The Panthers shot 54% from the field and forced seven turnovers to build a big lead. What looked like a potential blowout slowly turned into a dogfight as the Tigers scratched and clawed their way back in the game. Taunton’s defense stepped up to limit Franklin to just nine points in the second quarter while its offense found a grove, scoring 17. Quinn (13 points) and John Martins (11 points, eight rebounds, five assists) each hit a three, preceded by a bucket by Vendrell. Two free throws from Dante Law (who missed the majority of the game with foul trouble and fouled out with 5:36 left on a questionable call) cut the deficit to four, 22-18, before Franklin answered with three straight points. Law, Edgehill, Vendrell, Jalen Samuels, and Naz Kenion all missed minutes on the second due to foul trouble. 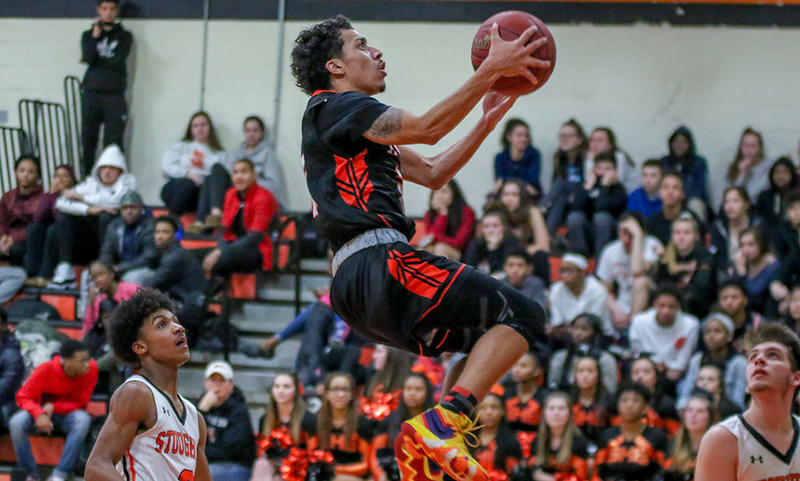 Taunton’s bench was able to provide a spark with Tyler Stewart (six points, five rebounds), Josh Lopes, Fabio Goncalves, and Krishon Nairne (two rebounds, block) coming to to give the Tigers some valuable minutes. A late three-point play from Jack Rudolph extended Franklin’s lead to eight but Martins responded with a triple. Franklin led 29-23 at half. Quinn sandwiched two buckets around one from Martin to knot the game early in the third, and a bucket in low from Stewart gave Taunton its first lead at 31-29. 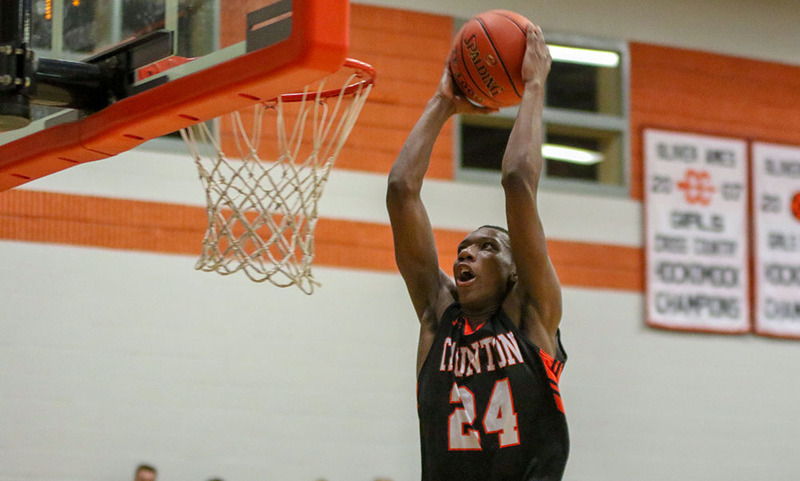 That’s when the Panthers turned to Samuels (12 points, eight rebounds), a senior captain, to weather the Tigers’ push. Samuels answered with a nice take to tie the game, and then used a two-handed flush to put Franklin back ahead. Samuels made a heads up play on defense, intercepting a pass and going the length of the court for a bucket while being fouled. His free throw completed the three-point play and put Franklin up 36-35. Taunton closed the third with a mini 4-0 run – a free throw from Kenion, a layup from Stewart, and a technical free throw from Martins – to make it 36-35 heading into the final frame. Will Harvey (12 points, seven rebounds) scored early and then capitalized on a Taunton turnover by adding a free throw to put Franklin up 39-37. Thomas Gasbarro and Kenion traded buckets before Samuels extended Franklin’s lead to four with 3:38 to play. Taunton had three looks but couldn’t convert but Quinn pickpocketed Edgehill at half court and went in for two to make it 43-41. Harvey hit a free throw after being fouled on an offensive rebound and Gasbarro drove to the basket for two after a Taunton turnover to make it 46-41 with 1:30 to go. “We just talked about what’s made us great over the years and that’s defense and that’s what we have to rely on now,” Neely said. “So down the stretch I went with more of a defensive lineup so we could get some stops. Putting Tom and [Jake] Macchi in there, they really grinded it out. Tom made some big plays for us, got some turnovers and gave us a huge lift defensively. Quinn scored on a putback after a missed three Franklin got a stop and Vendrell drove to the basket for two with 39.8 left but Edgehill’s triple sealed the win. Franklin boys basketball (4-2 Hockomock, 6-3 overall) is back in action on Tuesday when it travels to North Attleboro. Taunton (4-2, 7-3) will try to bounce back when it travels to Milford on the same day. FOXBORO, Mass. 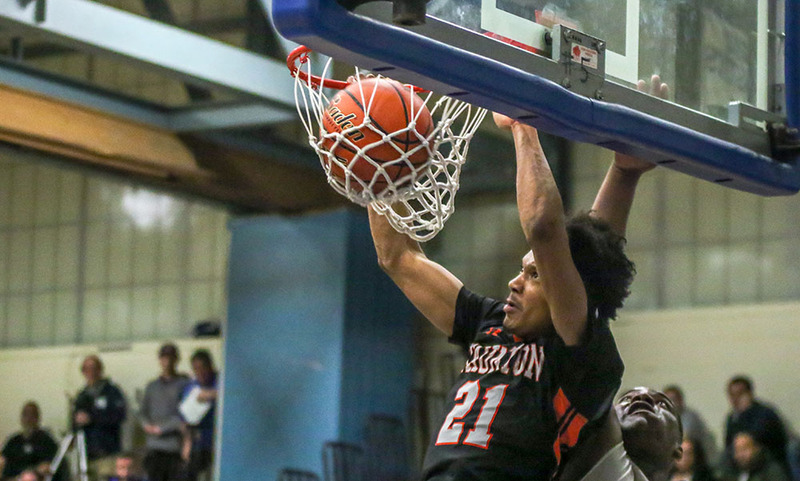 – Through three quarters of play, both Taunton and Foxboro boys basketball teams had spurts on the offensive end, but neither side was able to build a run to take control of the game. The Tigers had one of those spurts to open the final quarter, putting up six straight points to go ahead by a point, 39-38. But Foxboro had a response, orchestrating a 14-5 run over the next three minutes to seize control and grab a 56-49 win over Taunton. Foxboro held a 36-33 advantage going into the final quarter and extended it to 38-33, but Taunton rattled off a 6-0 run to take the lead. Senior Wesner Charles scored down low on a feed from senior Michael Quinn, and senior John Martins converted a fast break after Quinn caused a turnover. Senior Lou Vendrell (12 points) cashed in on a steal to put Taunton up 39-38. But as quickly as its lead disappeared, sophomore Kevin Gallagher gave the hosts the lead back. 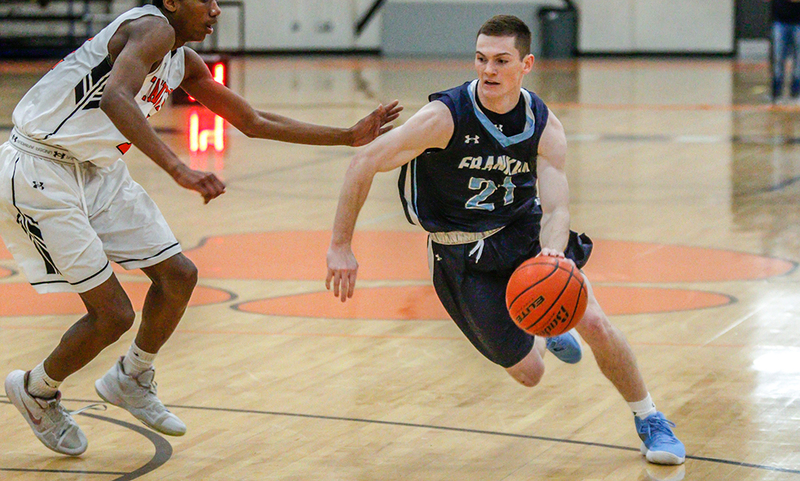 Gallagher drained a three, and junior Will Morrison hauled in a defensive rebound on the other end while being fouled, sinking two free throws to make it 43-39 with 3:54 to play. Taunton answered with a three from Quinn to get within one, but just seconds later, junior Brandon Borde (19 points) drilled a three on a feed from Morrison to keep the Warriors up. After getting a stop on the defensive end, Gallagher sank a deep triple to make it 49-42. Junior Dante Law (13 points) scored in traffic to make it a five-point game, but Borde sank another three on the other end to make it 52-44 with 1:51 to go. The Tigers didn’t go quietly as Law finished at the rim and drew an offensive foul on the inbounds. Taunton cashed in on a second chance three from Vendrell to make it a three-point game, 52-49, with 30 seconds left. Foxboro was initially trapped in the backcourt but used a timeout, got the ball in successfully and senior Anthony Mollica eventually sank both ends of a one-and-one to extend the lead to 54-49. The Warriors got another stop and Borde hit two free throws to seal it. 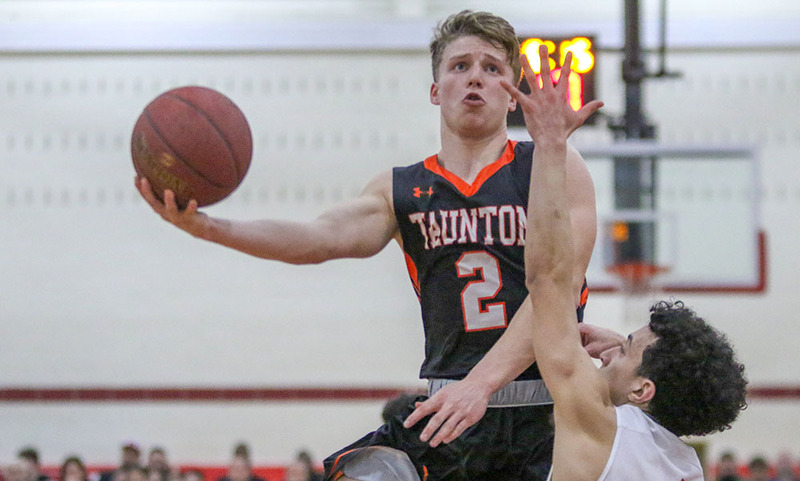 Taunton had leads in three of the four quarters, including the final frame, but couldn’t put together a run to turn a small lead into a large advantage. After scoring the first two points of the game, Taunton watched as Foxboro went on a 12-2 run for the rest of the quarter. The Tigers didn’t help themselves with four missed layups. Borde had five points in the opening frame, and Mollica hit a triple to give Foxboro a big lead early. The second quarter was a different story as Taunton had a run to get back into the game. The Tigers opened with a 12-0 run, highlighted by points from five different players. Law hit a three, sophomore Tyler Stewart converted in close, Martins and Quinn each scored, and Vendrell capped the run on a nice pass from Law. But Foxboro closed the quarter with a 7-0 burst, including a late three-point play from Mollica to give the Warriors a 23-21 lead at the half. In the third quarter, Foxboro extended its lead to seven when Gallagher hit a triple after an offensive rebound from junior Ryan Hughes (11 points), up 30-23. Taunton outscored the Warriors 10-6 the rest of the rest to make it a one-possession game going into the fourth. Foxboro boys basketball (1-2 Hockomock, 1-2 overall) is back in action on Friday night when it hosts Bishop Feehan. Taunton (2-1, 2-1) will try to bounce back when it hosts city rival Coyle & Cassidy on Thursday. TAUNTON, Mass. – With the playoffs nearing closer and closer, the teams that make the deepest runs are usually always armed with multiple weapons. The Franklin boys basketball team is looking like it’s going to be one of those teams. The Panthers had three players score 15 or more points, building a 12-point lead at halftime, going up by as much as 21 in the fourth quarter and then had to fend off a late charge from Taunton’s reserves to earn a 63-51 win on the road. Sophomore Chris Edgehill scored eight of his 15 points in the opening quarter, senior Jack Rodgers netted seven of his game-high 17 points in the second quarter and senior Paul Mahon spread his 15 points out equally across the second, third and fourth quarters to pace Franklin. Edgehill got the offense going early, accounting for over half of the Panthers’ 15 points. He opened Franklin’s scoring with a layup, hit a three, and later converted a traditional three-point play. The Panthers quickly turned their three-point lead to nine with an early 6-0 spurt in the second quarter. Rodgers scored back-to-back buckets, both on assists from Edgehill, and Alex Klowan capped the run on another feed from Edgehill. Mahon hit an open three and Klowan converted an offensive rebound to keep the lead at 10. A layup from Mahon and a triple with under a minute to go from Rodgers pushed the lead to 14 but Prince Brown answered for Taunton to cut the deficit to 12 (32-20) at halftime. The game opened up in the third quarter with a much faster tempo, which typically favors the Tigers. Taunton scored 14 points in the frame — its best period so far. But Franklin was equally as comfortable with the speed of the game, having its best offensive quarter with 20 points. Edgehill and Naz Kenion traded threes to open the third, then Kenion and John Martins combined for five points to cut it to 42-30. Mahon then connected on five straight points, Lens Esquil and Dante Law answered with two apiece but three from Rodgers and two from Paul Rudolph gave Franklin a 52-34 lead at the end of the third. “Franklin can go fast, they can go slow,” Dacey said. “Even without [Jalen] Samuels, they don’t seem to skip a beat. They still have the shooting, they still set the screens. They can still produce points from other places. Mahon gave the visitors a 21-point lead on two free throws (58-37) with three and a half minutes to play. That signaled for both teams to go to the benches for their reserves. Taunton’s second unit made the base of the opportunity. 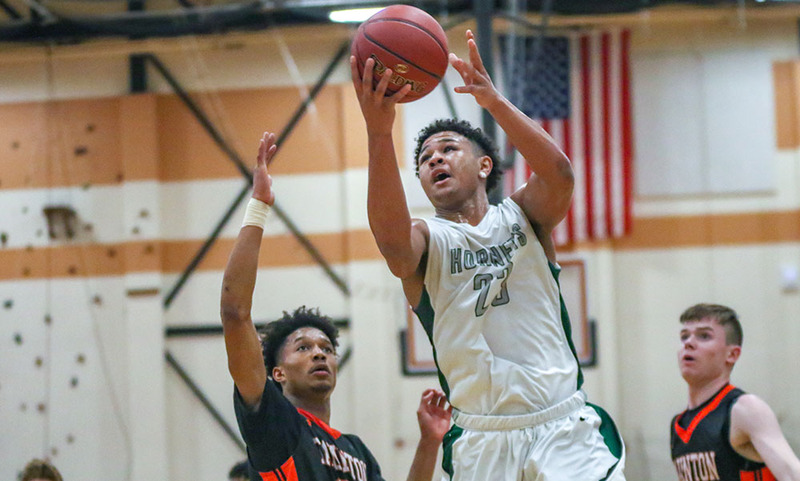 Michael Quinn drained a three, Brown scored with a strong take, Alex Midouin got to the free throw line for one after an offensive rebound and Malik Charles converted a putback for a traditional three-point play, finishing a 10-1 run over two minutes. Franklin put its starters back into the game at that point. Quinn scored again to make it a 10-point game and after an Edgehill free throw, Midouin scored down low to cut it to nine. But Mahon hit two free throws and added another after a Taunton miss to ice the game. Lens Esquil led Taunton with 14 points and six rebounds while Brown and Quinn each had six points apiece. Franklin boys basketball (12-1 Hockomock, 15-1 overall) stays in a tie atop the Kelley-Rex division with the win heading into Friday’s colossal clash with Mansfield. Taunton (6-7, 10-8) will try to bounce back when it travels to King Philip. ATTLEBORO, Mass. 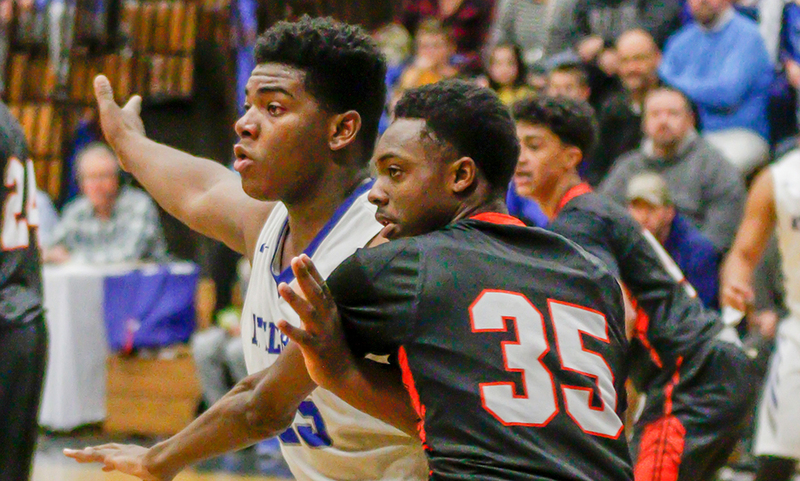 – It’s no secret that Attleboro’s 6’5 sophomore Qualeem Charles can be a game changer. But with opponents making him the focus of their defensive game plan, getting him the ball in the right spots can be a challenge. 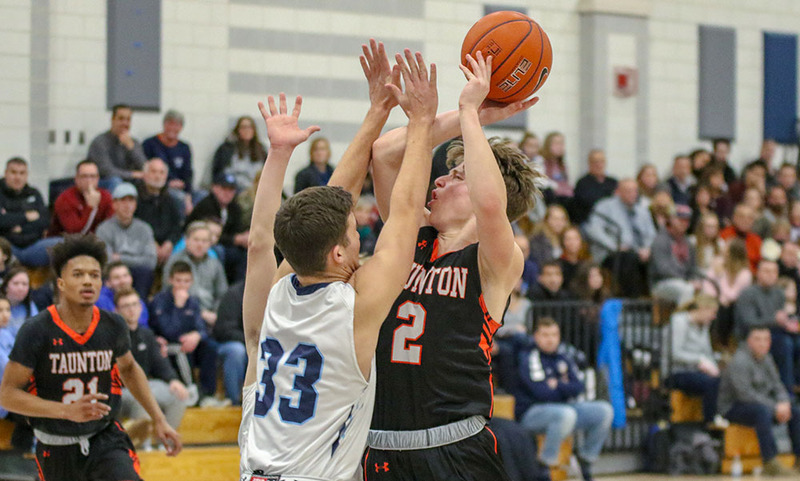 For three and half quarters, Taunton nearly neutralized the big man, fronting him in its man-to-man defense, bringing weak side help and even double teaming when necessary. But over the final five minutes of play, Attleboro finally got Charles going. The sophomore scored eight of his 11 points in that stretch, helping the shorthanded Bombardiers — playing without three starters — outscore the Tigers 16-7 and pick up a key division win, 57-47. Holding a 41-40 led with five minutes to go, Charles (15 rebounds) finally got into a rhythm. He increased the lead to three of a feed from Nate Douglas (nine points, six assists). Charles had all 11 of his points in the second half after the Tigers held him without a point over the first 16 minutes. Kevin Velazquez scored on a floater in the lane only for Taunton sophomore Prince Brown to answer with a three, keeping the deficit at two. Sophomore Jason Weir, who was starting his first game, drained a pair of free throws on one end and Velazquez came away with a block from behind on the other end. That allowed Attleboro get up the court and Velazquez dumped a pass over the top to Charles for an easy lay-in and a 49-43 lead. Despite coming off with an offensive rebound on its next possession, Taunton turned the ball over. That led to another connection between Velazquez and Charles, the latter finishing after an up fake to extend the lead to eight. An inbounds violation gave Attleboro possession back, and Charles hit one of two free throws on back-to-back possessions for a 53-43 lead with a minute to go. The Tigers and Bombardiers were near inseparable through three quarters. 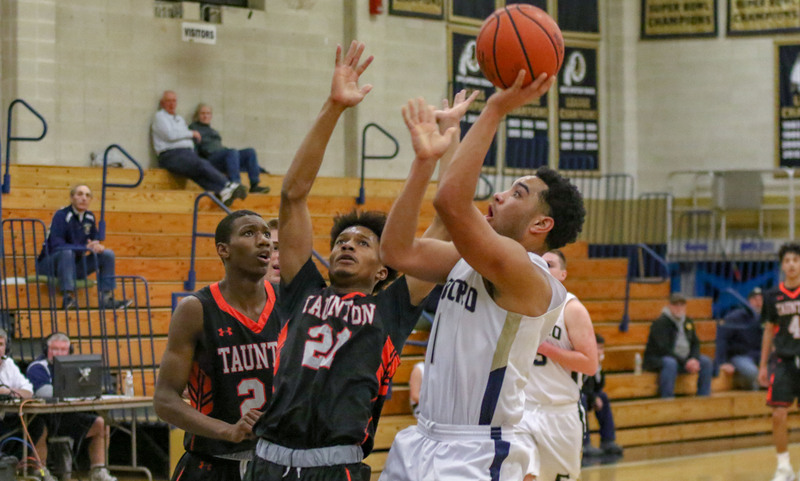 A pair of free throws from sophomore Dante Law (10 points, eight rebounds) helped pull Taunton into an 18-18 tie after the first quarter. Both offenses cooled down significantly in the second, scoring just six points apiece to a 24-24 score at halftime. Douglas converted on a feed from sophomore Bryant Ciccio (19 points, five rebounds) put Attleboro up six, and a free throw from Charles gave the Bombardiers their best lead, 37-28, with just over a minute left in the third. Taunton junior John Martins (eight points, three assists) scored five straight to get the Tigers within five at the end of three. The Tigers then used a 7-3 surge over the first three minutes of the fourth to get within one. Lens Esquil (18 points, 10 rebounds) scored early to make it a three-point game, and Law followed up with a bucket down low against the zone to make it a one-point game. A free throw from Brown tied the game at 38 but Weir drained a triple to give Attleboro the lead back. Law scored again to make it a one-point game, but Charles took control over the final five minutes. In the final five minutes, Taunton went 3-for-8 from the field with a pair of turnovers. Attleboro also had three offensive rebounds during the stretch. With Attleboro playing a zone defense for the majority of the game, Taunton was held to its lowest scoring output of the season, including just 4-for-14 from three. Attleboro boys basketball (5-3 Hockomock, 8-3 overall) will look to make it two in a row when it hosts rival North Attleboro on Tuesday at 6:30. Taunton (4-4, 7-5) will look to bounce back when it travels to rival Coyle & Cassidy on Sunday at 1:00.